To modify the project settings of your project, switch to the Projects mode using the mouse or Ctrl+4. The project pane is divided into two areas. At the top the currently active settings are shown. The active build or run configuration for all projects can be changed there. The bottom area allows you to quickly get an overview of the build, run and editor settings as well as the dependencies between your projects. It also allows you to edit those settings. Build configurations allow you to quickly switch between different build settings. 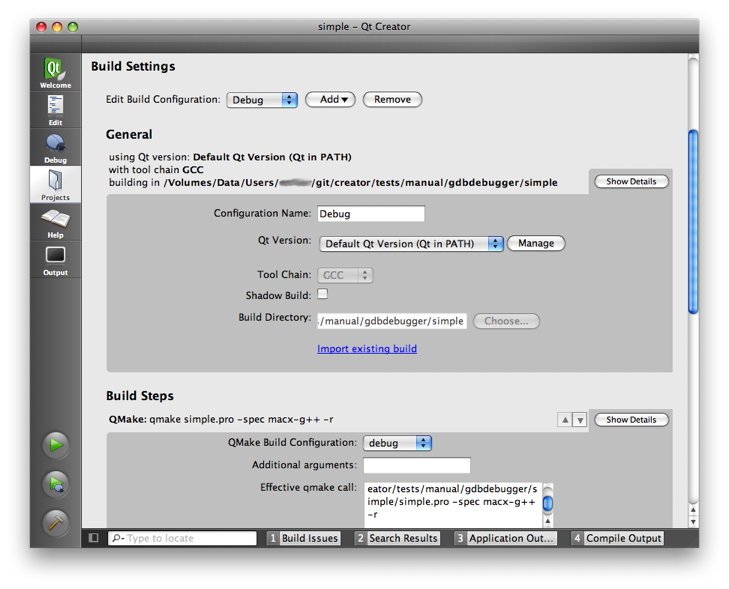 By default Qt Creator Qt Creator creates a debug and release build configuration. Both these configurations use the Default Qt Version. Action items to create, clone, or delete build configurations can be found at the top. You can have as many build configurations as needed. To edit settings click on the Show Details button. Here you can specify which Qt version to use to build your project, or whether to shadow build the project, for instance. 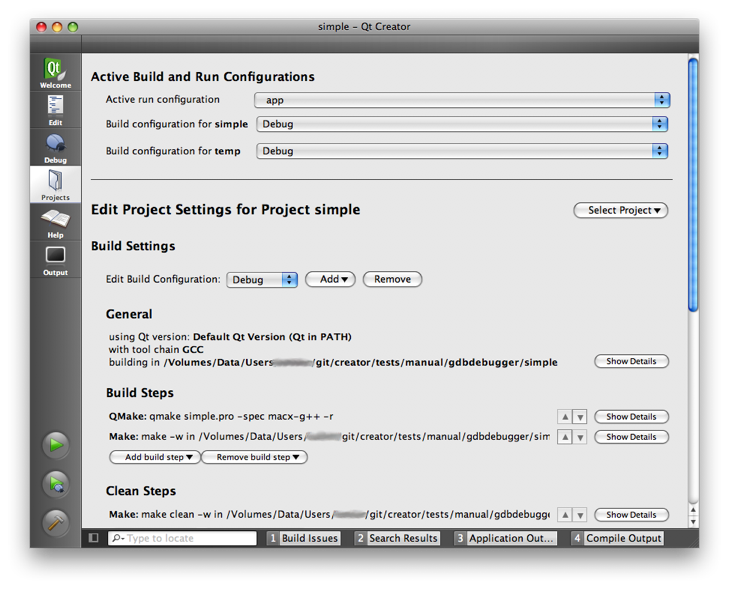 The build system of Qt Creator is built on top of qmake and make. The settings for qmake and make can be changed. Qt Creator will run the make command using the correct Qt version. In the Build Environment section you can specify the environment used for building. By default the environment in which Qt Creator was started is used and modified to include the Qt version. 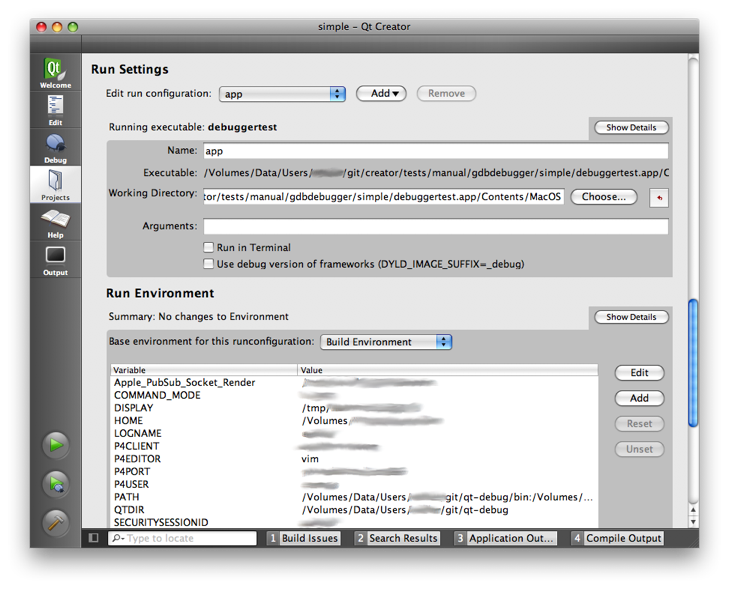 Depending on the selected Qt version, Qt Creator will automatically set the necessary environment variables. If you have multiple projects loaded in your session, you can configure dependencies between them. This will affect the build order of your projects. To do this, go the the Dependencies section after selecting the project for which you want to configure the dependencies, and then use the checkboxes to check which of the other projects is a dependency. Note: This is unrelated to the dependencies inside a qmake project.